A four carriage train with a blues singer/band in every carriage? How great is that! And it was too. 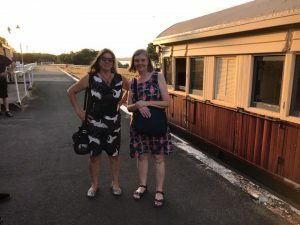 We arrived at 6.30 and were served a delicious meal of salads and slow cooked meats on the quaint little Queenscliff railways station. After a day of 36 degrees, it was fabulous to enjoy the cool sea breeze and watch the sun going down over a golden inlet covered with flocks of swans and pelicans. As darkness fell we boarded the train and set off towards Drysdale. At every stop we changed carriages so that by nights end we’d all seen four gigs. And very excellent gigs they were too. Dancing was not easy in a moving carriage but it was impossible not to tap your feet and claps your hands. We warmed up with International Blues Challengers, Rhythm X Revival, got really revved up by Japanese blues man, George Kamikawa, (Kampai!) chilled to the orginal songs of Wayne Jury and got dancing again to Tiana Martel’s powerful voice. 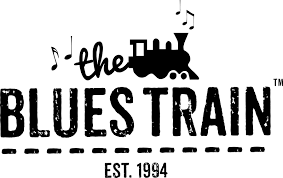 The blues, the train and the hot velvet night – maybe we really were in the Mississippi Delta. You can’t buy drinks on the train but you can get them (and an ice bucket to carry them around in) at the station. And an ice cream at Drysdale. Now that’s living! Many thanks to Hugo Armstrong of the Blues Train for the complementary tickets. This entry was posted in News, Station Stories and tagged Jane Routley, Melbourne, Music, The Blues Train by JaneRoutley. Bookmark the permalink.